PGW did construction work and left practically the entire street as one big pothole; there is a hole in the ground covered with plywood at the bottom of Gay St. This request must be follow-up with directly with PGW. Please feel free to call Philly311 at 3-1-1 or 215-686-8686 for PGW contact information. Thank you for submitting your request through the City of Philadelphia's 311 Contact Center. A case has been created for Parks and Rec Safety and Maintenance at Wissahickon Bike Trail and the Service Level Agreement is: 0 business days. The assigned Case # is 11606767. Your request will be forwarded to the appropriate Department. You may track the status of your request using the case number provided via our website at http://www.phila.gov/311/pages/default.aspx, or reply to this email, dial 3-1-1, or for outside of Philadelphia please dial 215-686-8686. Please note updates to the website may take up to 48 hours to appear. A junkyard has popped up at the corner of Ridge and Rochelle. Owner blocks the sidewalk with stacks of tires and junk cars forcing pedestrians to walk in the street. Please contact Feet First Philly - a pedestrian advocacy group, part of the Clean Air Council. You can contact Logan Welde (215) 567-4004 (126). 05/16/2014 Here’s a pic taken yesterday showing the cars and tires blocking the sidewalk on Ridge Avenue near Rochelle and Osborn. 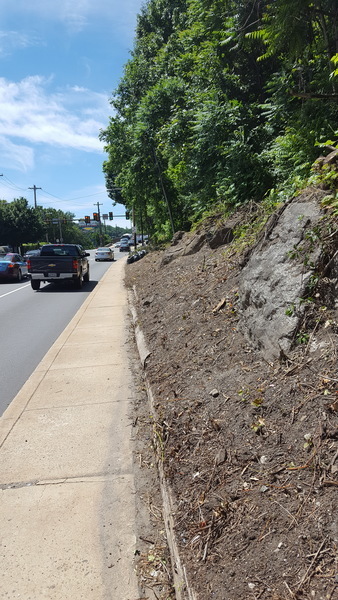 05/16/2014 Listed below are links to other SeeClickFix complaints about the sidewalk on Ridge Avenue just down the hill. 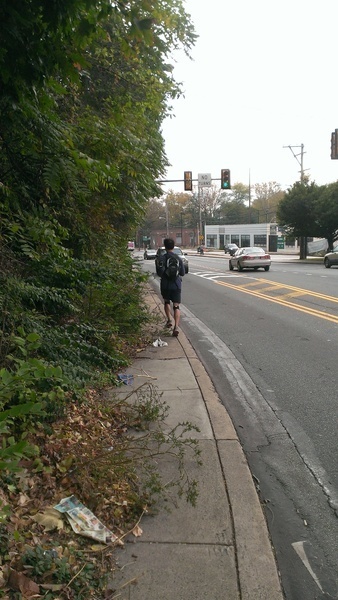 Some go back to 2009 and nothing has been done about them, at least not by the city or by SEPTA, even though that sidewalk connects the SEPTA Wissahickon train stop to the SEPTA bus stop at the bottom of the hill. Not even a front page article in the Inquirer about a blind Temple law grad (who had complained about the sidewalk being blocked by weeds to the mayor and SEPTA) got anything done by the city or SEPTA. A volunteer from the bicycle community had to temporarily fix the problem. Thanks for the pictures and addition information. I can not determine the company's name however. If you have this information please let me know. The 4500 block of Smick street and parallel block of st David has not been plowed. Backhoe seemed to start plow of st David's but left huge mound of snow in middle of street. Grey Chevy S 10 pick up truck has been parked at 162 Carson Street since July and hasn't moved. Its registration is expired, and so is the inspection sticker. Also has a flat tire and bags of garbage in the bed of the truck. Walking along Ridge Avenue just west of Tommy Gunns parking lots is dangerous due to overgrown vegetation. The problem is made worse by the lack of proper curb in the same area. This is along the most direct path between the Wissahickon Transfer Station and the Wissahickon SEPTA station. It is a very dangerous situation and could easily result in a pedestrian being struck by a vehicle. 01/06/2013 Not only does the vegetation need to be cut back, but a foot or so of sidewalk should be cleared of dirt and debris. 10/19/2013 In spite of the efforts of a volunteer from the bike community, this extreme danger still exists. Two weeks ago, while biking nearby, I heard a young woman walking on the sidewalk screaming in fear as cars came within inches of striking her. The Streets Department is aware of this situation. 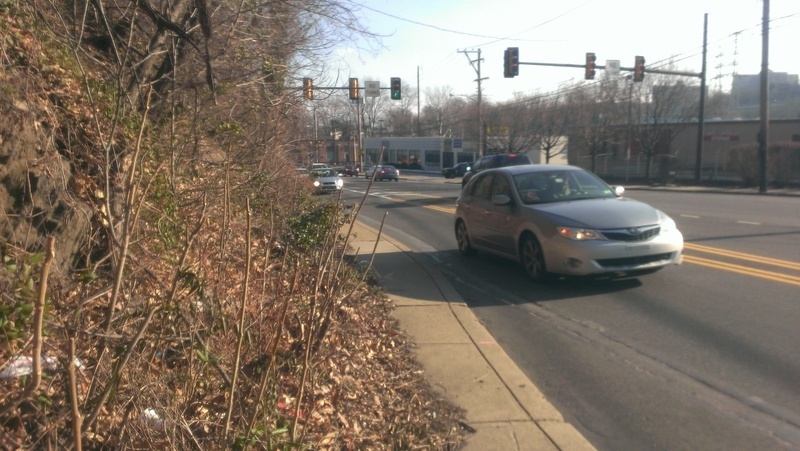 There seems to be a “not-my-problem” issue between the Streets Department and SEPTA. 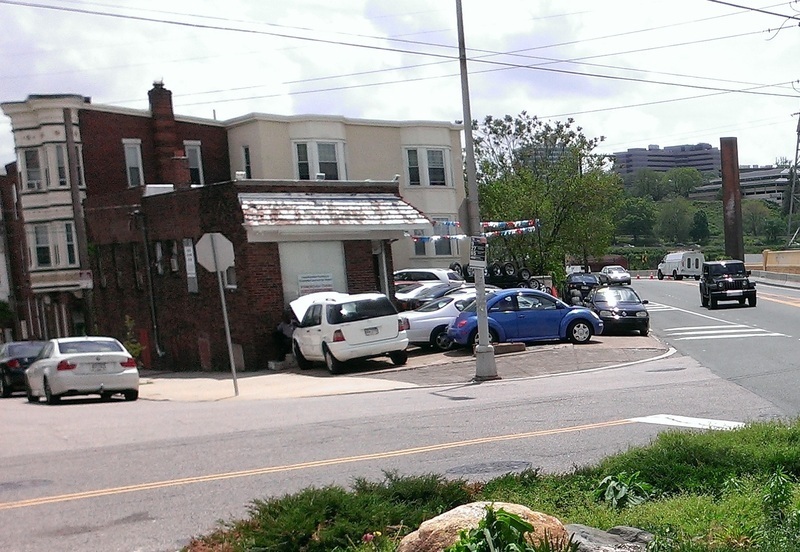 Will this be addressed by the Wissahickon Gateway project? Also see SeeClickFix # 83764, 71510, 155272, 85016 and the previously mentioned 8523. 06/15/2016 Within the last several weeks, the vegetation and trash were removed. According to a Wissahickon neighbor, a volunteer group, possibly church-related, performed the much-needed clean. However, more sidewalk needs to be uncovered and a permanent solution is needed. There's a shallow, but wide pothole starting to develop here. The location is right after you turn onto Kelly Drive from Ridge Ave (about 10ft past Ridge Ave after you make the turn). This pothole was still there on Sunday. Still there today. It's about twice the size as it was compared to when I first reported it.